Creating a new account on Facebook is actually easier and a lot of bloggers who already provide this information in detail , but in my experience that the current passed privacy and Facebook is very strict in accepting new user registrations . A few weeks ago I had made a friend Facebook account , and after completion of the appropriate provisions , it is not good news came to me . The news is a friend of my Facebook account is banned because it is considered as a pretend account , whereas previously issued Stegment Facebook rarely like that , there is what is it ... ? ? ? ? . However , I'm confused , when I registered my friend , no there is a good offense that I have presented or the other . However , it still accounts .. my friend blocked . 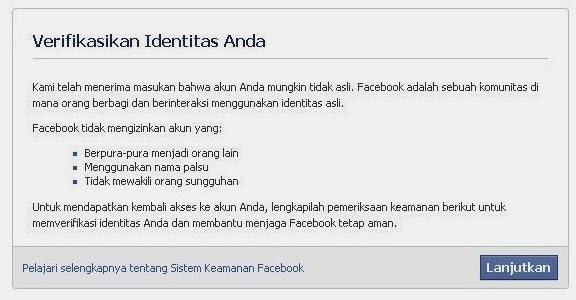 Finally , .. After strive hard and spirit , Powerful ways that our Facebook account is not blocked by Facebook or considered that our facebook account deemed not genuine I can avoid. How the Latest Listings Facebook account I will describe in the next article , this is the way I have done as many as 15 times while registering new users belonging to a friend or order guy , and I also managed without fear blocked . Hopefully , .. I am also going to make an E-book on How to register a Facebook account , Twitter , and blog updates. This e-book I will give it Internet , waiting for ya ! ! ! .